The design of a prototype of the next Aston Martin Vantage follows that of the 2015 DB10. Fresh photos of the new Aston Martin Vantage sports car undergoing testing show how closely the design follows that of the 2015 DB10 that was built purely for the James Bond film Spectre. The replacement for Aston's entry model will be revealed this year ahead of sales starting in 2018, the company has said. 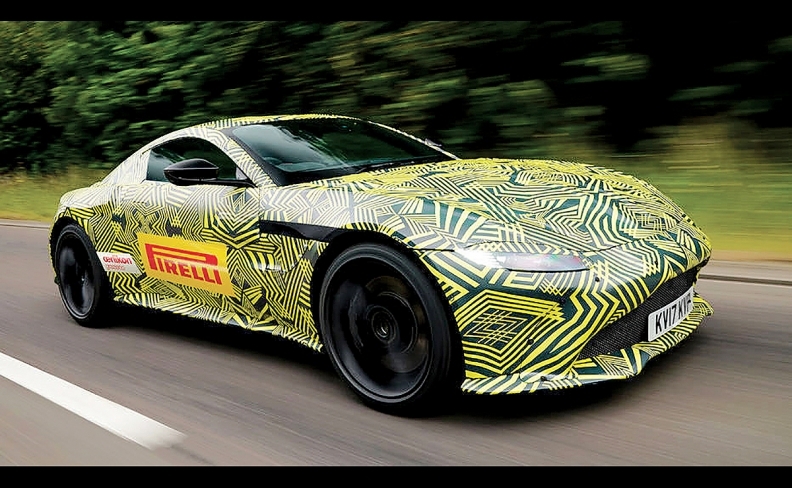 The camouflage of the prototype car fails to hide the reverse-angled grille first seen on the DB10, giving the replacement Vantage a radical new look compared with the current car. The Pirelli sticker on the side is a nod to the fact that the production car will use Pirelli tires, Aston Martin said. The other sign on the car reads Oerlikon Graziano, an Italian company that supplies manual transmissions for versions of the current Vantage, suggesting the British company might continue to offer a manual in the new car. It also makes dual-clutch transmissions for high-performance cars, which would be a first for Aston Martin. The new car is expected to launch with a V-8 engine supplied by Daimler's Mercedes-AMG performance arm. The bigger DB11 model is now offered with the same engine alongside Aston's V-12. The Vantage will be unveiled at a private event, a spokesman for the company said.